213 v. : ill. ; 28 cm. TVS-6 (June 1937) - TVS-218 (Nov. 1980). Vols. 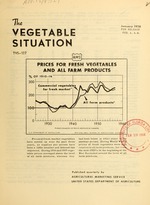 for 1937-Nov. 1953 issued by Bureau of Agricultural Economics; 1954-Jan. 1961, by Agricultural Marketing Service; Apr. 1961- by Economic Research Service; Feb. 1978- by Economics, Statistics, and Cooperatives Service; Nov. 1980 by Economics and Statistics Service, each a subdivision of the United States Department of Agriculture; Nov. 1980 approved by the World Food and Agricultural Outlook and Situation Board. Acres Acres Cwt. Cwt. Cwt. cwt. to average substantially above those of last winter. plies of a year ago, but substantially larger than the 1949-55 average. the 1956-57 and the 1957-58 seasons. tion during the first half of the year will be smaller. is likely to be somewhat smaller this year than last. average above those of a year earlier. months are expected to hold prices well under 1949-55 average levels. and watermelons was below that of a year earlier. melons amounted to about $118 million compared with $103 million in 1956.
largely the result of damage caused by the December 12 and 13 freeze in Florida. flooded vegetables on low ground in the Lower Valley and Coastal Bend. vented satisfactory recovery of the more advanced fields. materially higher than a year earlier. Danish cabbage are selling at high levels. average above those of most recent years. western States has resulted in smaller remaining supplies than a year earlier. less in the central States, and slightly less in the western States. Eagle Pass, and low temperatures retarded growth of young plants in some areas. earlier and in excess of anticipated demand. probable would likely result in marketing difficulties and depressed prices. California were marketed at prices well below those of most recent years. Only the relatively small volume from Arizona brought above average prices. harvest were cut somewhat by low temperatures and excessive rains in Florida. production of winter celery is expected to be above average. is expected to be 8 percent larger than last winter and 11 percent above average. January were larger than a year earlier and prices averaged materially lower. those of a year earlier. so that leaf spot and rust are a serious problem on surviving acreage. both last year and average. last year, and substantially above average. quide suggests an aggregate planted acreage 1 percent less than last summer. be substantially larger in early summer and moderately larger in late summer. watermelons and no change for late summer. U. S. D. A., Washington 25, D. C.
about 4 percent smaller than 1956 but about in line with the 1949-55 average. for asparagus, and slightly to moderately lower for other processing crops. $272 million, 14 percent less than the value of the 1956 crop. heavy supplies of a year ago, but substantially larger than the 1949-55 average. moderately to substantially below the high level of a year earlier. two or three months will have some influence on packer operations in 1958.
items have been low relative to their raw product, labor and material costs. the same as in 1957, but slightly to moderately above the 1949-55 average. juice appear to be moderately to substantially smaller than a year earlier. with the objective of an 8 percent larger tonnage. requirements, come from the early fall crop. of each seems desirable to bring supplies in line with anticipated demand. objective of 7 percent less snap beans, and 6 percent less sweet corn. than in the previous season, and the pack of snap beans almost a tenth larger. available on January 1 distributor stocks. be moderately to substantially smaller than the heavy stocks of a year earlier. season about into balance with anticipated demand. beginning of the current season, were about a third larger than a year earlier. These larger stocks more than offset the estimated reduction in pack. and "other" vegetables slightly to moderately smaller. to put up another large pack in 1958.
ened somewhat from the spring low. 13 million hundredweight above the USDA acreage-marketing guide recommendation. Prices during the fall remained at fairly low levels. but not later than May 31, 1958.
a relatively small quantity diverted a year earlier. the year, averaging 15 percent during the last 3 years. levels for the corresponding months of 1957. 2 percent of production. Imports were less than half as large as exports. markets during the next few months. potatoes. Canada also has minumum grade and size restrictions on imports. guides and the Conservation Reserve Program of the Soil Bank. dredweight compared with 195 million in 1957.
of the "bid" procedure to get land out of production and reduce surpluses. reserve under provisions of the regular program which also continues in effect. for a minimum of three years at certain specified rates of payments. Tennessee, and down slightly in Kentucky and Louisiana. about $3.35 per hundredweight, compared with $3.50 for the same period of 1956.
into the spring, and are likely to average above year earlier levels. Government holdings, at about 300,000 bags, were less than half as large. and 39 percent for the period 1951-55.
cent larger than a year earlier and a fourth above the 1951-55 average. 1951-55 average of 40 percent. some may be unfit for human consumption. under price support, 2.9 million bags of which were delivered to the CCC. Deliveries of 1957 crop beans are expected to be substantially less. averaged $7.41 per hundredweight compared with $6.81 a year earlier. average. Compared with 1956, smaller production was reported for all classes. The sharpest drop, 37 percent, was in Alaskas and other smooth green peas. only 17 million pounds, less than a third those of a year earlier. is expected to hold prices well under 1949-55 average levels. izes only in years when the European crop suffers severe weather damage. acreage at or below that of 1957. I/ Includes some quantities used for processing. 2/ Includes Casabas, Persians, and other muskmelons. which separate estimates of fresh market and processing production are not prepared. : : : : : : : : :::::::::. 1/ Except watermelons. /j Includes shallots, chives, cipolinas, leeks, scallions, and green onions. (California), Philadelphia, Pittsburgh, St. Louis, San Francisco, Seattle, and Washington, D. C.
SDol. Dol. Dol. Dol. Dol. Dol. :Florida : 1-3/4 bu. crt. :California: 4 doz. pony crt. 2 crt. 3 doz. bchs. :California: 2-3 doz. 16 in. crt. :Florida : 1-1/9 bu. bskt. :Arizona : 2 doz. heads, crtn. 1/ Long Island. 1 3/5 bu. bskt. 2/ 85 percent or more U. S. No. 1. / Florida 60 Ib. crate. Period Jan. : Feb. Mar. Apr. : May : June : July : Aug.: Sept.: Oct.: Nov.: Dec.: Av. added; broccoli, sweet corn, cucumbers, and watermelons. Acres Acres Acres tons tons tons Dol. Dol. Dol. i/ Production and price on a "shelled" basis. / Corn in the husk. SCanner/ : Wholesale distributors _! I/ Converted from actual cases to standard cases of 24 No. 2 cans by S&HR Branch of AMS. / Includes combination vegetable juices containing at least 70 percent tomato juice. (pickles 68, sauerkraut 54, and pimentos 29 cases equivalent to 1 ton fresh). 4/ Reported in barrels; converted to 24 No. 2 by using 14 cases to the barrel. / Estimated basis, California pack. Canners' stock and pack data from National Canners Association, unless otherwise noted. Wholesale ;li.tributors' stocks from United States Department of Commerce, Bureau of the Census. :acres acres acres Cwt. Cwt. Cwt. cwt. cwt. cwt. acres acres acres Cwt. Cwt. Cwt. cwt. cwt. cwt. I/ New Jersey, Maryland, and Virginia. 2/ North Carolina, South Carolina, Georgia, and Florida. : Dol. Dol. Dol. Dol. Dol. Dol. F.o.b. and terminal market prices submitted by Market News reports of AMS. Dol. Dol. Dol. Dol. Dol. Dol. submitted by the Market News Service representative at each market. / Includes beans grownfor seed. 2V Bags of 100 pounds. ,i. : Idaho and :Colorado and: . 2/ Includes Montana, Wyoming, INebraska, and Washington. / Includes Maine, New Mexico, Minnesota, Arizona, and Utah. 3/ Bags of 100 pounds, cleaned basis. l/ In commercial producing States. 2/ Bags of 100 pounds, clean basis. Includes peas grown for seed and cannery peas harvested dry.